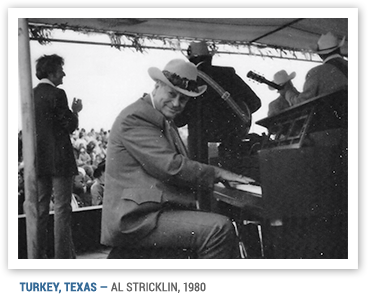 To understand Bob’s music, it is important to look back to the early days when he and Milton Brown and several other musicians in and around Fort Worth were creating something not quite like any other music. It came to be called Western Swing, but its roots are all over the place. Bob arrived in Fort Worth determined to play many different kinds of songs. Initially, he worked with very small groups so most of what he and his band mates did sounded somewhat like the music of other string bands. But from the very start, something about Bob’s music was different. Bob loved blues music. He especially loved the singing of Bessie Smith and later said that he styled some of his own tenor vocals on her example. He was drawn to the blues in part by the way many blues songs made fun of hard times and didn’t wallow in self-pity. He could play soulful blues solos on fiddle, as in his extraordinary solo in “Bob Wills Special” from 1940. Blues strains were found in much of the jazz of the 1920’s, and Bob loved jazz music too. In his early years, he drew on the energy of jazz tunes, the way many were written and performed and the boisterous combination of solo and rhythm instruments. Bob worked with some remarkable, broad-minded musicians in Fort Worth, especially Milton Brown. They played dances, created a huge fan base on the radio, and got hired to form what became the Light Crust Doughboys. They also began composing some of their own songs. When Bob left the Doughboys in 1933 and formed his own group, he had the basic outline of what became his mark on the musical world. He really brought it to its fulfillment, though, only when he got to Tulsa and set up his long-term base camp with the Texas Playboys.